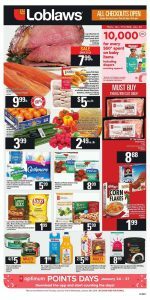 Loblaws Flyer Special Sale 21 Jan 2019 contains special food and gift ideas for this week. Do not miss your advantage card to save points. 10.000 pts for every $50 spent on baby items including diapers. You must have a PC optimum member. Click the image and see terms and conditions in store for redemption restrictions. Loblaws offers special food opportunities as always. In the cover page of this Loblaws flyer, you can see how cheap all foods. Cap off prime rib premium oven roast cut from Canada AAA grade beef only for $8 this week. Loblaws Flyer Special Sale 21 Jan 2019 is full of advantages. Daily deals, daily beasts, and deal of the week available in the cover page of this flyer. Pick your favorite healthy food and make a special dinner for your family and friends. All good memories cames from Loblaws. Special gift ideas and more available in the third page. Enjoy your food, enjoy your shopping at Loblaws.